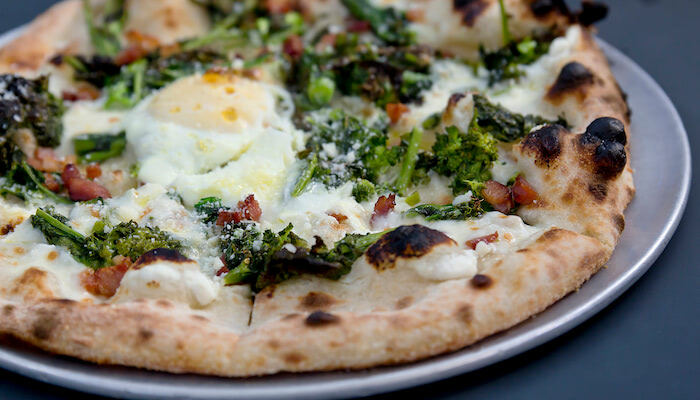 Your menu items are the lifeblood of your operation and, chances are, you diligently work with your distributor to choose crust types that work best with your recipes and maximize kitchen efficiency. It’s a smart business practice, and one you could easily apply when considering sauces as well. Which sauce method is the most time- and cost-efficient for your operation? Let’s compare fresh and fully prepared sauces. Pizza makers take pride in their sauce, often times laboring over generations-old family recipes to perfect the taste unique to their pizzeria. Cooked sauce is often simmered for hours to produce deep, robust flavors and the signature brownish-orange color patrons recognize. The process has the side benefit of permeating your operation with a tempting aroma that really whets appetites. Fresh sauce advocates, however, contend that cooked sauce can taste scorched. Uncooked (Fresh) sauce is synonymous with fresh tomato flavor. Makers can use garden-picked produce, or peak-season “fresh pack” tomato products that are canned with low-heat methods to get bright red, farm-fresh sauce that requires no cooking prior to use. Canned products used for fresh sauce? Yes! “Fresh pack” is the key — using remanufactured tomato products (tomato paste diluted back into sauce after the tomato season ends) will not deliver fresh results. Fresh sauce fans define it as flavorful and authentic; cooked sauce users tend to think fresh sauce is too wet and bland for pies. 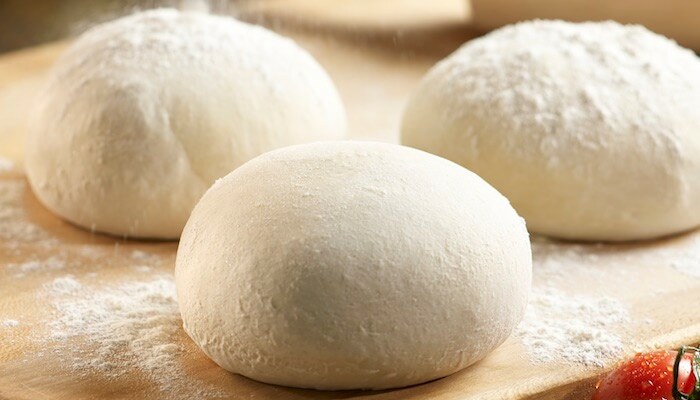 Cooked or uncooked, scratch-made pizza sauce takes time to create – and that can present challenges for busy kitchens. Some operators opt for using pre-made tomato bases and adding signature spice blends. This solution saves time, but consistency is often called into question. Is the same amount of spice used in every batch? Is the tomato base as dense? Is every batch properly mixed for even spice dispersal and taste? These are all valid concerns, and your distributor likely has a solution. Ask them about fully prepared sauces made by manufacturers — like Arthur Avenue Fully Prepared Sauces by the Alive & Kickin’ Dough Shop. Fully prepared sauces are a great option: complete fresh or cooked sauce made from authentic Italian recipes with the same high-quality spices you would use — then frozen at the height of freshness for convenience, consistency and quality. Variety isn’t an issue with fully prepared sauces either, as manufacturers often offer Alfredo and ready-to-use pizza sauces. Some manufacturers, like Alive & Kickin’, will even work with you to create custom pizza and pasta sauces from your recipes — signature tastes your patrons love, ready in a fraction of the time! Water content: Pasta sauce contains more water and less pulp than pizza sauce. Flavor: Pasta is enhanced by flavors found in marinara sauce – onion, garlic, herbs – more so than the uncooked tomato-based pizza sauce. 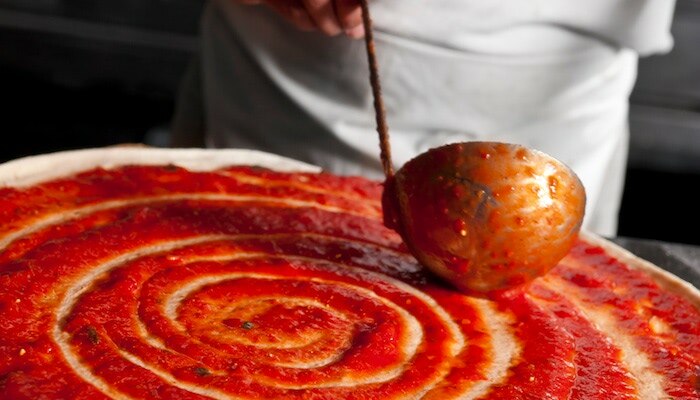 Texture: Pizza sauce typically has a high fat content from olive oil, making it thick and pulpy. Pasta sauce is generally lower fat, thinner and delivers a smoother mouth feel. These differences don’t mean you have to bog down your kitchen with making separate pasta sauces from scratch though. Many of the manufacturers’ product lines your distributor carries for pizza sauce also offer pre-made pasta sauces. Scratch-made or fully prepared sauce preparations pack a powerful punch of flavor, but only fully prepared sauce can streamline your inventory, cut costs and save time without compromising quality or consistency. 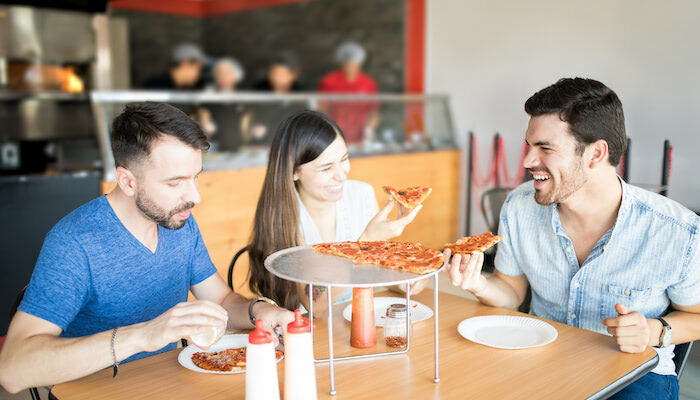 Determine your potential costs – and savings – by taking advantage of a new sauce option with the Pizza Ingredients & Costs Calculator. Click the button to download your free copy!